Karjakin now shares the lead with Carlsen in Shamkir. | Photo: Shamkir Chess. It was a cute moment during the live broadcast of the tournament today, this time provided by Tata Steel Chess tournament director Jeroen van den Berg, Vugar Gashimov's brother Sarkhan and Veselin Topalov's old friend Silvio Danailov. During the round, Sergey Karjakin's wife Galiya and his oldest son Alexei had arrived in Shamkir and so it was in the press room where the family first saw each other again. When his father came in, the little boy interrupted the commentary and shouted "papa!!" before being picked up. Karjakin stated that he had felt their support during his game with Vishy Anand and had an "extra responsibility" for them to play a good game today. And it was definitely a good game. For starters, Karjakin brought a novelty as late as move 31 (!) which was a deviation from Aronian-Caruana, London 2018. Here 31.c5N was played, instead of Aronian's 31.Rxf4. "It's the first line of the computer, so nothing to be proud of," said Karjakin. "Probably in this position [after 34.h3] Vishy underestimated that the game is not over. White can play a little bit." Karjakin re-united with his oldest son Alexei. | Photo: Shamkir Chess. Karjakin pointed out inaccuracies by his opponent and showed both great technique and sharp calculation that brought him the full point. An impressive effort. Karjakin scores an important win vs Anand. | Photo: Shamkir Chess. Veselin Topalov scored his first win of the tournament, against Shakhriyar Mamedyarov. Once again the Azerbaijani grandmaster missed some crucial tactics, although in this case, it was hard to blame him because he had to see things much in advance when he went for the active 24...Ra4, a move that more cautious players wouldn't have tried. Veselin Topalov scores his first win in Shamkir. | Photo: Shamkir Chess. Magnus Carlsen and Ding Liren played their sixth classical game, and it was their sixth draw. It was the world champion who was under pressure. "I got kind of a tough position out of the opening. I don't know what went wrong but it became a bit unpleasant. The danger about these symmetrical positions is that the extra tempo can sometimes be a huge factor. It's also often seen in the Exchange Slav that either it's a clear draw or otherwise if Black cannot force the draw it's usually a bit unpleasant. If you get control of the only open file then you're doing well." Carlsen survived "a tough position out of the opening." | Photo: Shamkir Chess. 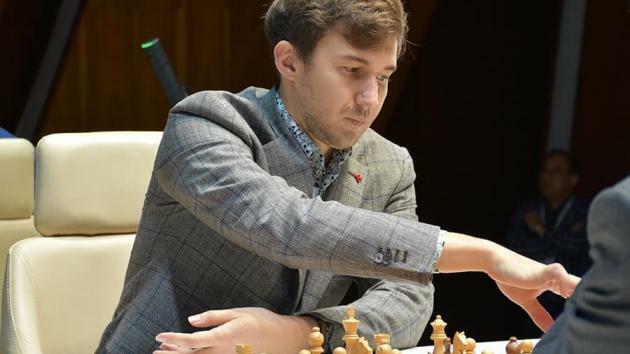 As press officer Eteri Kublashvili pointed out to Carlsen, Grischuk had pointed out the dangers of symmetrical positions as well after his game with Karjakin. Carlsen: "I actually listened to it but maybe didn't take it seriously enough." At some point the Norwegian grandmaster decided to avoid passive play, and chose a concrete continuation that led to a worse, but not lost endgame. "I was just happy to stay afloat and I was happy to find this move 23...Re8 finally. Obviously it's very ugly just going for a rook ending a pawn down but I couldn't really see what he could do at that point and anyway, other ways I don't think I could equalize." Giri checking on Ding vs Carlsen. | Photo: Shamkir Chess. Asked about the "most important moments of the game," David Navara said: "An important moment was that this time my preparation turned out to be good." The Czech GM is playing a much better tournament than last year, and had the better end of the draw against Anish Giri. The Dutch felt he somehow had to punish 10...Ba5, which looks a bit slow, but he couldn't figure out how. "I should have looked at this at home. OK, maybe I did, I couldn't really recall." Navara wasn't sure if he was really better, but Giri was happy to end the game as "the position wasn't fun anymore." Giri was happy to end his game with Navara. | Photo: Shamkir Chess. Giri and Navara both admitted that football, which was played on the rest day but not by them, is not really their thing. Instead, Giri played a simul and he mentioned one game he played against a girl, who played extremely well in all phases of the game and kept on neutralizing his attempts for an initiative. After the game he asked her about her rating, and it turned out to be 1350. Giri: "That's when I realized how bad this tournament is really going for me." Asked why he is in last place, Giri said there's no real explanation, and that it happens to every player every once in a while. Navara: "I think there's another reason: this time it's not me who is in last place after six rounds!" Navara already scored half a point more than last year with three rounds to go. | Photo: Shamkir Chess. Alexander Grischuk and Teimour Radjabov drew in a variation from the Queen's Gambit Accepted that's not very common at the highest level. Grischuk liked his position out of the opening ("usually I like it when I'm better.") but was also impressed by Radjabov's play. The active plan with ...h5 and ...g5 provided excellent counterplay which kept the game balanced. An interesting draw between Grischuk and Radjabov. | Photo: Shamkir Chess. "I don't know because I don't play bullet well! You should ask Magnus or Hikaru. I think there are three guys: Magnus, Hikaru and Firouzja, and then everyone else, with Magnus being clearly the best." And what about switching from classical chess to bullet? "Switching is not the problem. The problem is not being good enough!"